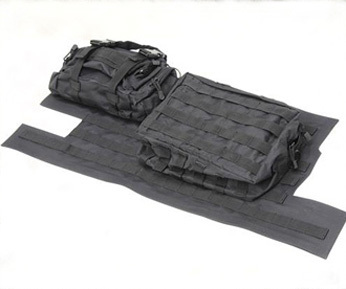 This tailgate cover faces the interior of your vehicle and features interchangeable PAL/MOLLE storage pouches. Add useful storage to the tailgate of your Jeep JK or JKU with this cover and keep items secure when offroading. Available in four colors to suit your style. SmittyBilt, one of the foremost names in off road equipment has created this ingenius solution to onboard storage for Jeep JK and JKU. 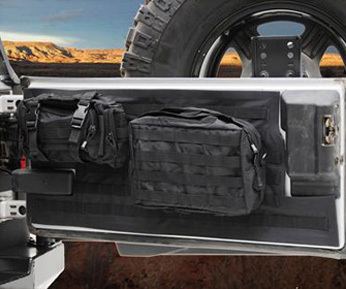 This tailgate cover faces the interior of your vehicle and features interchangeable PAL/MOLLE storage pouches. Designed to match Smittybilt's G.E.A.R. Seat Covers, this tailgate cover is manufactured utilizing 600 Denier Polyester. Given that most off-road vehicles see a lot of sun, it's good to know that these tailgate covers are completely UV stable. Interested in a Smittybilt G.E.A.R. Tailgate Cover for your Jeep JK or JKU Wrangler?